South Korea and the United States agreed Friday that a highly symbolic inter-Korean event will be held in North Korea next week as scheduled, Seoul's top nuclear envoy said. 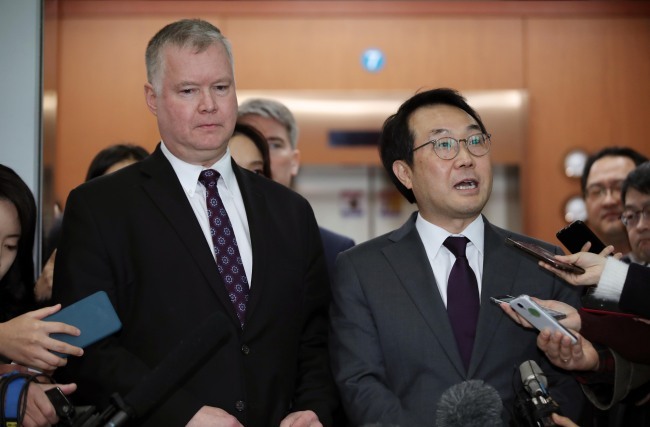 After a "working group" meeting with Washington's special representative for North Korea, Stephen Biegun, Lee Do-hoon said the two Koreas will also proceed with their joint war remains recovery program under the Trump administration's agreement. The issue of providing North Korean residents with Tamiflu, an antiviral medication, has been also resolved, Lee told reporters. The two Koreas plan to hold a groundbreaking ceremony in the North's border town of Kaesong on Wednesday for their work to modernize and re-connect cross-border roads and railways. Seoul sought to head off a possible controversy over the ceremony, as Pyongyang is subject to a wide web of tough sanctions led by the US and the United Nations for its nuclear and missile program. The allies also agreed that they face a crucial moment in the coming months for the complete denuclearization of the peninsula and establishment of a peace regime, he added.